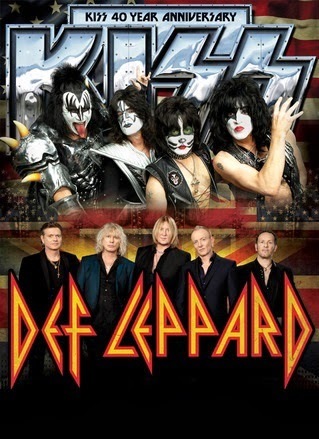 LOS ANGELES – March 17, 2014 – This summer two of the world's greatest rock bands, KISS and DEF LEPPARD, are set to deliver a massive tour dedicated to fans who wanna rock and roll all night! These two legendary rock bands spanning two continents announced today that they will launch the tour as KISS celebrates their 40th year in music. The summer's biggest hit-fueled rock tour, promoted exclusively by Live Nation, will storm through 40-plus cities throughout North America kicking-off on Monday, June 23 in West Valley City, UT at the USANA Amphitheater. Tickets go on sale starting on Friday, March 21 through the Live Nation mobile app and at www.livenation.com. With combined album sales of over 200 million, KISS and Def Leppard are more than just iconic; they remain TODAY'S dominant powerhouses of rock tallying 30+ chart-topping hits, countless sold out MEGA tours and awards and accolades from around the globe. Known for their elaborate and spectacular stage shows, each band plans to give fans the ultimate summer concert experience with the most impressive lighting and sound production ever along with KISS' signature over-the-top pyrotechnics. KISS consists of vocalist/bassist Gene Simmons, vocalist/guitarist Paul Stanley, lead guitarist Tommy Thayer and drummer Eric Singer. Def Leppard consists of vocalist Joe Elliott, guitarist Vivian Campbell, guitarist Phil Collen, bassist Rick “Sav” Savage and drummer Rick Allen.